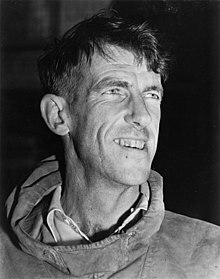 Sir Edmund Percival Hillary (20 July 1919 – 11 January 2008) was a New Zealand mountaineer, explorer, and philanthropist. On 29 May 1953, Hillary and Nepalese Sherpa mountaineer Tenzing Norgay became the first climbers confirmed to have reached the summit of Mount Everest. I’ve always hated the danger part of climbing, and it’s great to come down again because it’s safe … But there is something about building up a comradeship — that I still believe is the greatest of all feats — and sharing in the dangers with your company of peers. It’s the intense effort, the giving of everything you’ve got. It’s really a very pleasant sensation. Tenzing had been waiting patiently, but now, at my request, he unfurled the flags wrapped around his ice–axe and standing at the summit, held them above his head. Clad in all his bulky equipment and with the flags flapping furiously in the wind, he made a dramatic picture, and the thought drifted through my mind that this photograph should be a good one if it came out at all. I didn't worry about getting Tenzing to take a photograph of me — as far as I knew, he had never taken a photograph before, and the summit of Everest was hardly the place to show him how. I became a Hindu. I was very close to the Hindu ethic. It was a great spiritual experience. ... I believe a man can make his own destiny through his work and effort. Cited in Pioneer, 9/11/1990. Quoted from Elst, Koenraad (1991). Ayodhya and after: Issues before Hindu society. The beekeeper and the Sherpa, one from a remote former colony of the Crown on the edge of the Pacific Ocean, the other from the edge of the heavens. They affirmed the power of humble determination and, placing themselves firmly with the mythic paradigms of their respective cultures, won one for the underdogs. 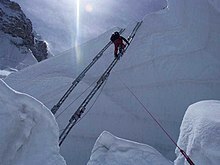 … On this lonely planet of freeze dried food, computer generated fabrics and commercialised mountain climbing, it is almost impossible to imagine the earth-shaking impact that Hillary and Norgay’s achievement had in 1953. For many it represented the last of the earth’s great challenges. It placed Hillary in the lineage of great terrestrial explorers. … His achievement as one of mankind’s great accomplishments came at one of the last times in history when such a feat could still be recognised as a distinctly human one, and not technological. … Hillary’s near-mythical status puts him on a plateau above sporting heroes, for he has distinguished himself well beyond the singularity of a mountain. From a feat that would have been the crowning achievement of many careers, he has gone on to become a humanitarian, an ambassador and elder statesman, never giving up, never giving in to either despair or complacency, always planning the next goal. This page was last edited on 6 November 2018, at 09:25.